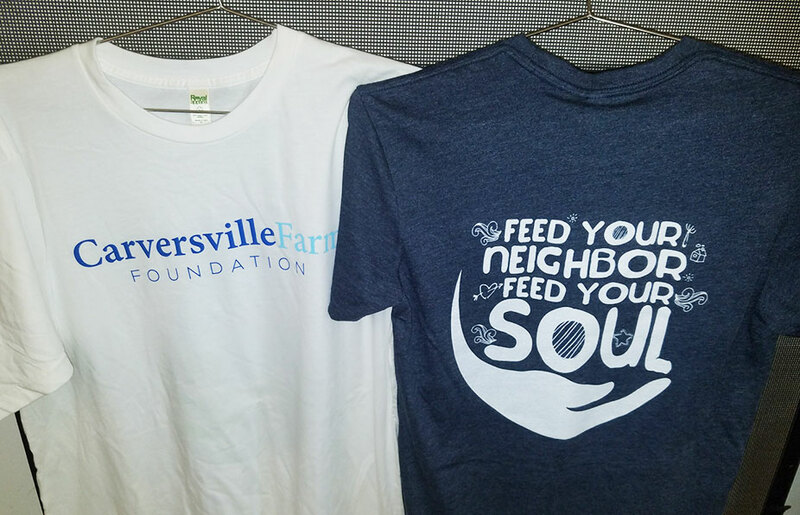 Carversville Farm Foundation recently made a special donation: 3,000 pounds of goat. Of course, we raise animals all year long, so we can donate the best pastured meat and eggs to the people who need them the most. But this donation was a bit different: we donated live goats to help launch a new farm. 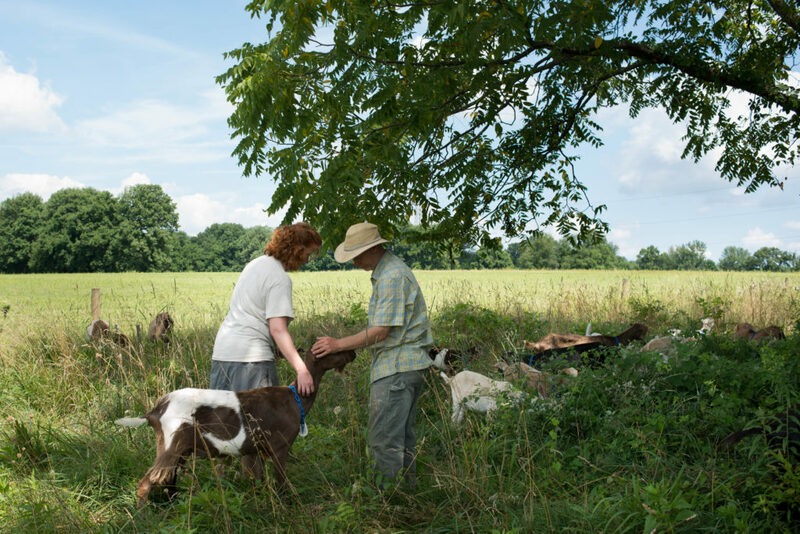 Abby O’Keeffe of Wrightstown has long dreamed of farming and last month she and her husband moved to a little farm on 37 acres of rolling pasture, which they put into conservation. With plans for a raw-milk goat dairy, Abby had a few Nigerian Dwarf goats and was in the market for more, when she heard through the Bucks County 4H Goat Club that we were looking for a new home for our dairy goats. A few meetings later, we decided Abby should get her goat – quite a few of them, actually. We are proud to have presented Abby with 16 nanny goats and 18 growing kids. The goats have quickly settled into their new home at Narrow Way Farm. Abby is delighted that they are La Manchas, as she says their milk is especially delicious. We couldn’t agree more. 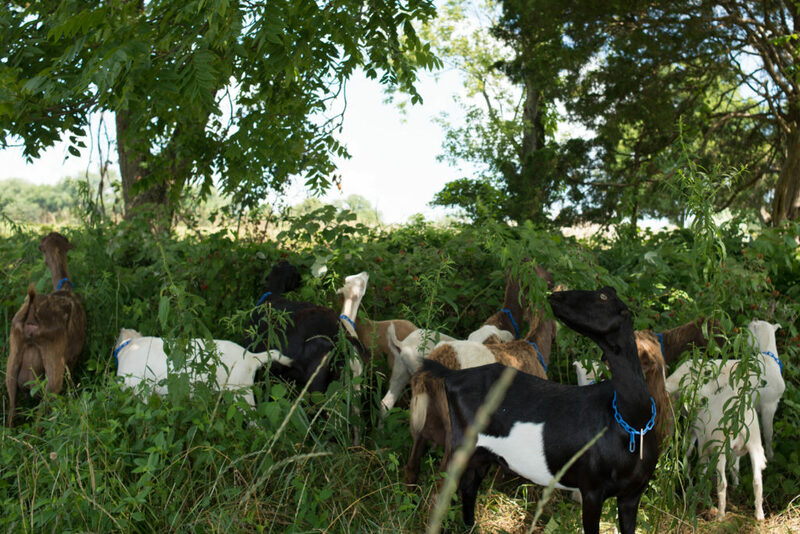 We loved raising these goats on fresh pasture, in a “flerd” with our other livestock, moving them to fresh grass daily, which is best for both the animals and the land. We’re proud to have made some delicious cheese with their fresh milk, and to have donated some of the kid meat to Philadelphia soup kitchens. And now we’re proud to be seeding a likeminded farm, right here in Bucks County. So congratulations Abby. An old Gaellic tale suggests it’s good luck to meet a goat at the beginning of a journey. While Abby’s determination and faith will serve her well, let’s hope the 34 goats she’s meeting at the beginning of this journey bring her an abundance of luck as well. And now we at Carversville Farm Foundation return to our regularly scheduled donations of meat and eggs! Our garlic crop has been harvested and is in the process of being dry cured for storage! This year’s harvest is looking big and beautiful, in fact we expect to double our production from last year! When the garlic is cured, it will be shelf stable and ready to be sorted. 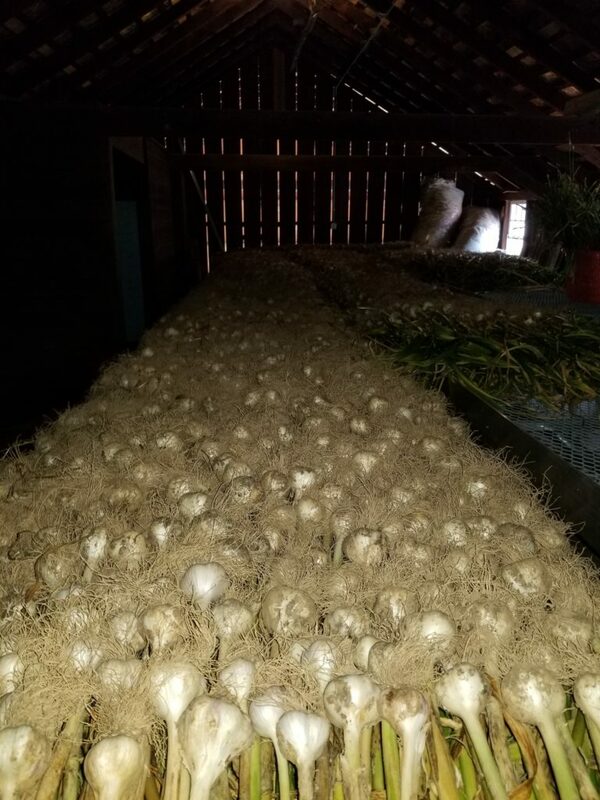 We sort our garlic into three grades: some we will donate immediately, some we will save for seed to plant in the fall for next year’s garlic crop and some we will hold onto for donation over the course of the fall and winter. 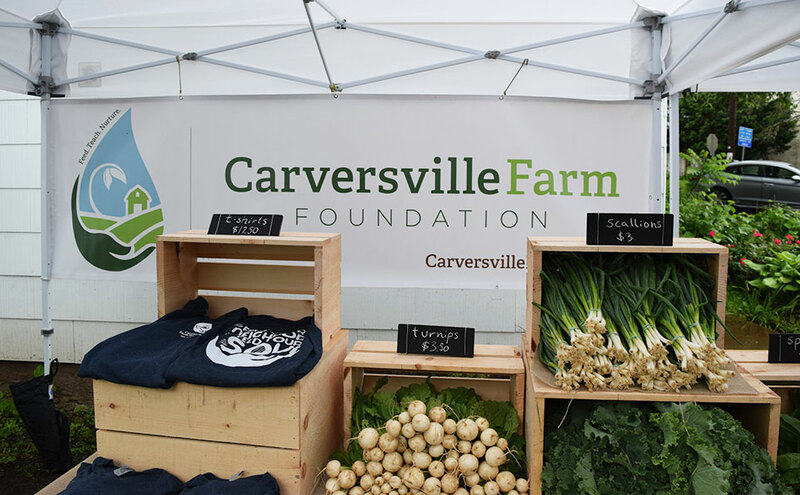 Fresh organic garlic is one of our favorite products to be able to donate. Not only is great for seasoning dishes, but has many known health benefits. Tomatoes, potatoes, and carrots! OH JULY! This past month has been a rollercoaster for the veggie crew. All the rain we endured has caused soggy fields, and set some crops back, but we’re not letting that stop us! We have harvested hundreds of pounds of carrots, thousands of pounds of potatoes, curing garlic, and our tomatoes are popping with color. Our greens, onions, corn, and herbs are pushing through. We were able to plant our fall brassicas (cabbage, broccoli, kale, etc. ), which are loving the cooler nights. Let’s look forward to a bountiful and dryer August! Meet SAM! Sam helps keeping our farm looking beautiful! 1. How long have you been in farming? 2. What made you want to go into farming? While living in Virginia, I did a lot of volunteer work with the VDGIF and Shenandoah Riverkeeper. 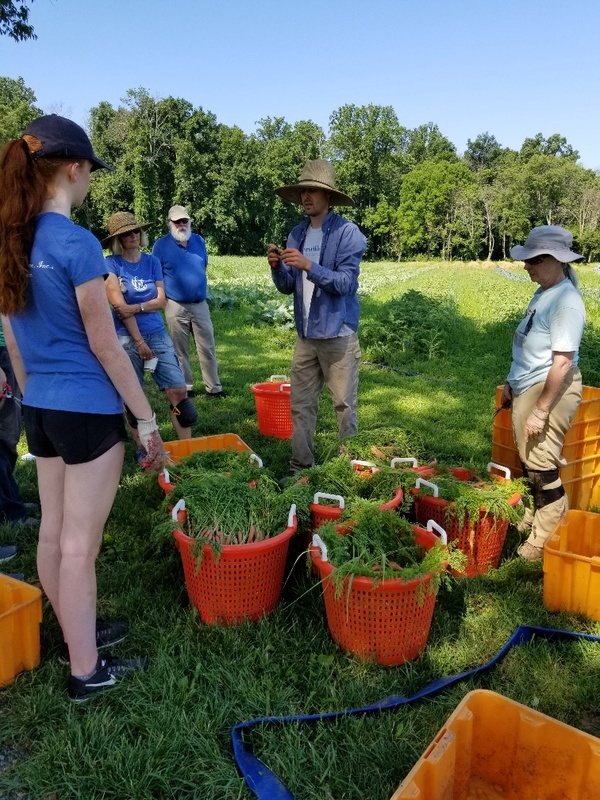 We were finding out how much large-scale conventional agriculture was creating massive pollution problems in the state’s freshwater systems and ultimately the Chesapeake bay watershed. At the time I made a friend who was working on a 6 acre, organic vegetable farm. Seeing that farm was my “ah-ha” moment. I wanted to work outside with my hands, help protect the environment, but also produce a healthy, sustainable product for me community. Farming because the obvious next step for me. I then had my first internship as a farmer and that is where my early interests turned into passion and a career. 3. What is something you have experienced here that you never expected? Everyone at CFF gets along and works well together. I never expect farms with big crews to always get along, but it seems that here at CFF the whole staff really enjoys working together. Fall is my favorite season because you still have late summer crops producing but also start to see things like greens, hakurei turnips, fall radishes and cold crops coming back. My favorite fall vegetable is the misato rose radish. 5. What is your typical day for you at CFF? Team meeting, load up equipment and most likely hop on a fenceline for the morning, maintaining the road fronts, gates, hedge rows, etc. Days at CFF definitely have structure but there are always fun projects that get thrown into the mix a few times a week. 6. How do you unwind after a long day at the farm? A bike ride down the the wing dam in Lambertville to cool off in the river and relax. 7. What is something you can’t wait to make using ingredients from our farm? I just started a big batch of kimchi when the last red nappa’s were pulled out, its almost ready! 8. What’s a quote you live by? 9. What advice would you give to someone thinking about going into farming? Jump right into a full time season farm crew position if you can. If you have land, start small, and don’t be afraid to fail, it is inevitable. You will lose crops, break equipment, push your body to its limits, and just flat out fail. Keep a journal, learn from your mistakes and ask for help from other farmers. 10. If you had to pick, whats your favorite piece of equipment we have? Stirrup hoe. The stirrup hoe changed my life as a farmer. Spacing your rows and individual plants to match the different sizes of stirrup hoes makes weeding almost easy.